Thursday Night Football is different this week; it has a different and better flavor with the Thanksgiving celebration taking place; and as we get together with family and friends to celebrate life and love, we can also enjoy this traditional American sport in great company. 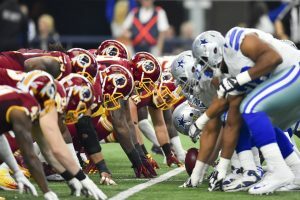 Three games will take place on Thursday, November 24 and my favorite by far is the Redskins vs. Cowboys game that will take place at the AT&T stadium in Arlington, Texas, the rivalry between these two teams and their current level leads me to believe it will be an awesome game. Last time these two teams met was back in September 18 and the Cowboys got away with a 27-23 win. Will the story be the same this time around? Here are my thoughts on it. The Cowboys are 9-1 in the season, having won their ninth game in a row against the Ravens last week; they are a one of the favorite teams to dispute the Super Bowl. Quarterback Dak Prescott saved the day against Ravens, and continues to impress with his abilities, now completing 67.7% of his passes for 2,640 yards, scoring 17 touchdowns and only two interceptions. Even though running back Ezekiel Elliott had a tough start in the game against Ravens, he has had a very good performance throughout the season and if he has a good day Thursday the Cowboys should be difficult to stop. Dallas’ defense looked good; we can say it has improved from the beginning of the season. Washington is coming from a solid 42-24 win over the Packers, making their record for this season 6-3-1. Quarterback Kirk Cousins has had a major role leading the team to the win; the Redskins offense has continued to improve and had an awesome performance in their game against Packers; the same cannot be said about their defense that continues to struggle every game; this will be a problem against Dallas since they just faced the number one rush defense last week and came out victorious. If Washington loses on Thursday their chances of winning the NFC East will pretty much be null. Redskins though have a good chance; they have played against great opponents and come out with strong wins. The line for this game is of -7 for the Dallas Cowboys playing at home. Overall the Cowboys are the better team in all aspects. The Redskins already lost to the Cowboys earlier this year at their own stadium, and now they are going on the road to face a stronger Dallas. Bottom line, I believe although Redskins are not a bad team, they will not be able to pull this win over Dallas. Pick: Cowboys to win… try to get a lower line of course, but I am banking on the Dallas covering the spread. Total line for the game is of 51 … most are going under in this total, I like the over. Place your NFL bets at AceSportsbook.com and win big this Thanksgiving! Happy Thanksgiving to all football fans and bettors out there!